Prague hotel Legie is situated at the heart of the city, close to the famous Wenceslas Square and within a few minutes walk of countless bars, nightclubs and entertainment venues. Public transport departs from stops just 100 m from the hotel. The comfortable rooms all have an en suite bathroom and are equipped with a direct dial telephone, satellite cable TV, electronic key card and a safe. All rooms are heated. Central city hotel Legie offers a total of 55 rooms, of which 7 are single rooms, 20 are double rooms and 26 are large triple rooms and 2 family rooms 2+ 2. 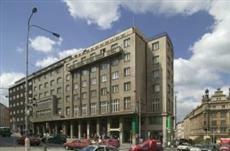 The hotel offers a 24-hour reception with safe, lifts, a conference room, a seminar room and an A la carte restaurant. Laundry and medical services are available. Eurocard, MasterCard, VISA, American Express and Diners Club are accepted in the hotel.